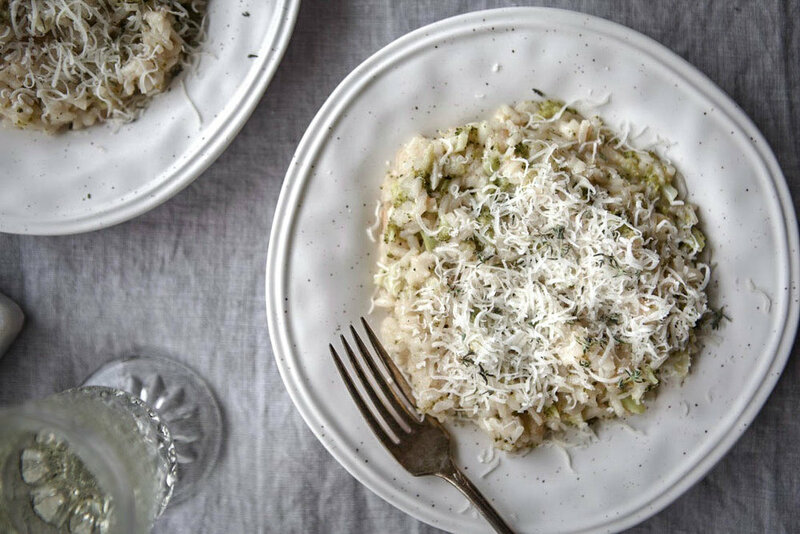 This is by far one of my most favourite risotto’s and is absolutely perfect for these cooler fall evenings. Comforting, creamy, luscious and absolutely delicious it is a true crowd pleaser. 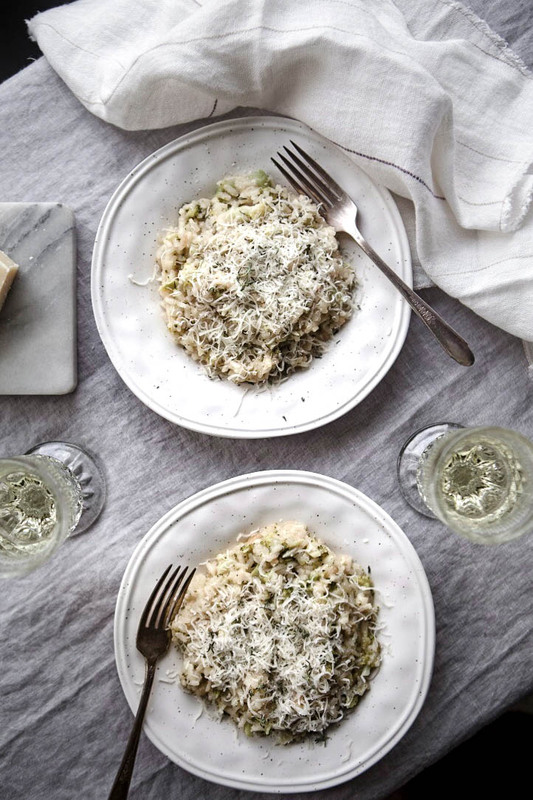 Yes, risotto take a little tender loving, aka stirring but think of it as your therapy for the evening…put on a little Italian jazz, pour yourself a glass of wine and grab your favourite wooden stirring spoon. I love the addition of broccoli here, it goes so well with the fresh parmesan, adds texture and makes ya feel good because you are eating something green! 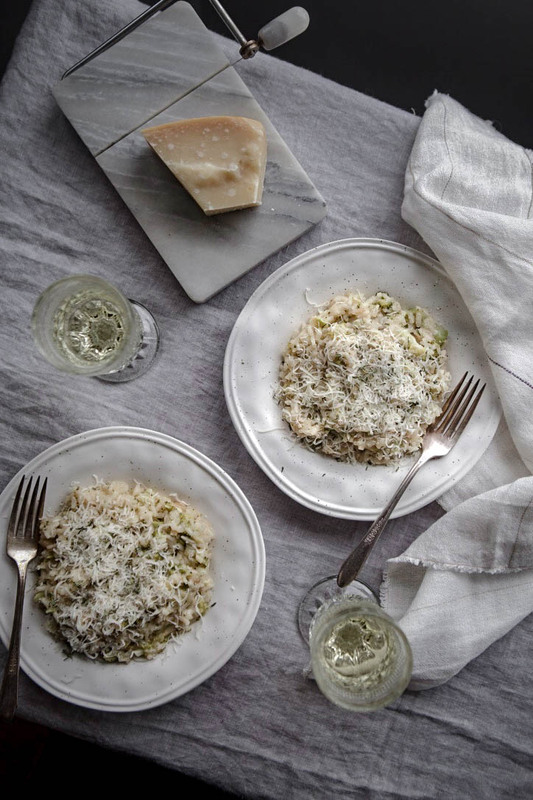 I hope you enjoy it as much as we do, butcher quality bone broth, a good white wine and quality parmesan make all the difference in this risotto…don’t skimp! In a small pot add the bone broth, bring to a boil and then down to a simmer. You want it warmed for when you add it to the risotto. Finely mince the garlic and shallot, set aside. Cut the thick ends of the broccoli off so you are just left with the dark green head and finely chop, set aside. Place a large deep pan on medium heat. Add in 1 tbsp of olive oil and 2 tbsp of butter. Add the shallot and garlic and sauté until lightly browned. Once browned deglaze the pan with 1/4 cup white wine and bring the heat down to a high simmer. Add in the arborio rice and sauté until translucent in colour. Next stir in one cup of white wine and stir until it is absorbed by the rice. Next you are going to ladle in one cup of bone broth at a time, stirring until the rice as absorbed each cup. You may or may not need the entire litre of bone broth (mine usually takes the whole thing), just keep adding in ladles until the rice is not absorbing anymore of the liquid. Before the final ladle (usually it takes at least 5 for me, so after the 4th) add in the broccoli and 1 cup of fresh parmesan, stir well. Add in your final ladle of broth and once absorbed add 1 tbsp of butter and stir (this brings everything together and makes it extra creamy). Season with salt and pepper. Serve with fresh parmesan and maybe my white wine chicken (they goes exceptionally well together).